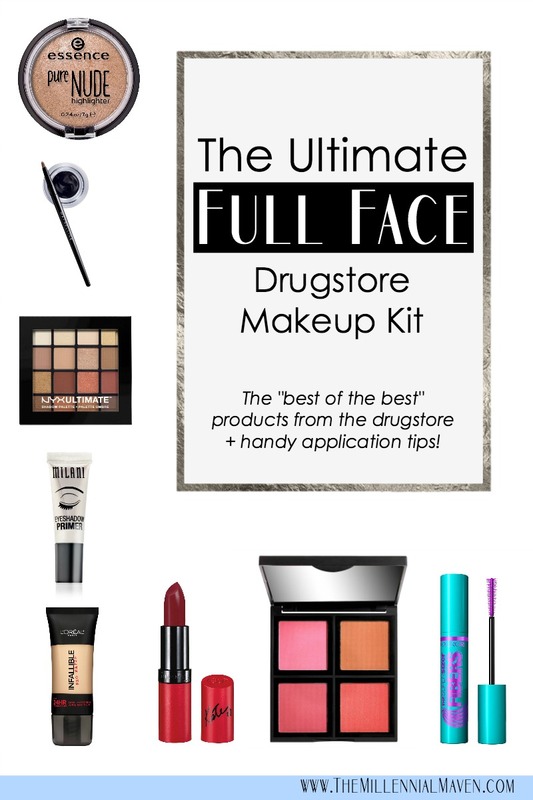 The Ultimate (& Foolproof) Drugstore Makeup Kit — Perfect for Beginners! This is the ultimate drugstore makeup kit. No joke. I realize I have a ton of posts showing random products from the drugstore that I love and that I think everybody should own. 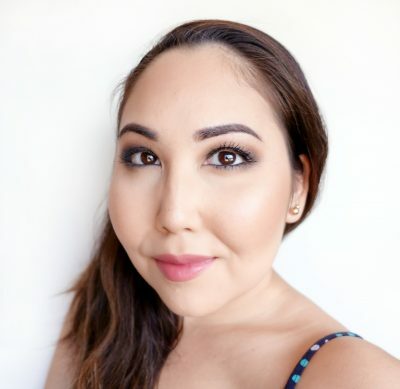 However, what I don’t have is a master post detailing exactly what I recommend for makeup beginners, or even just those of us who really enjoy high-end stuff, but want to venture a little deeper into the drugstore-land. 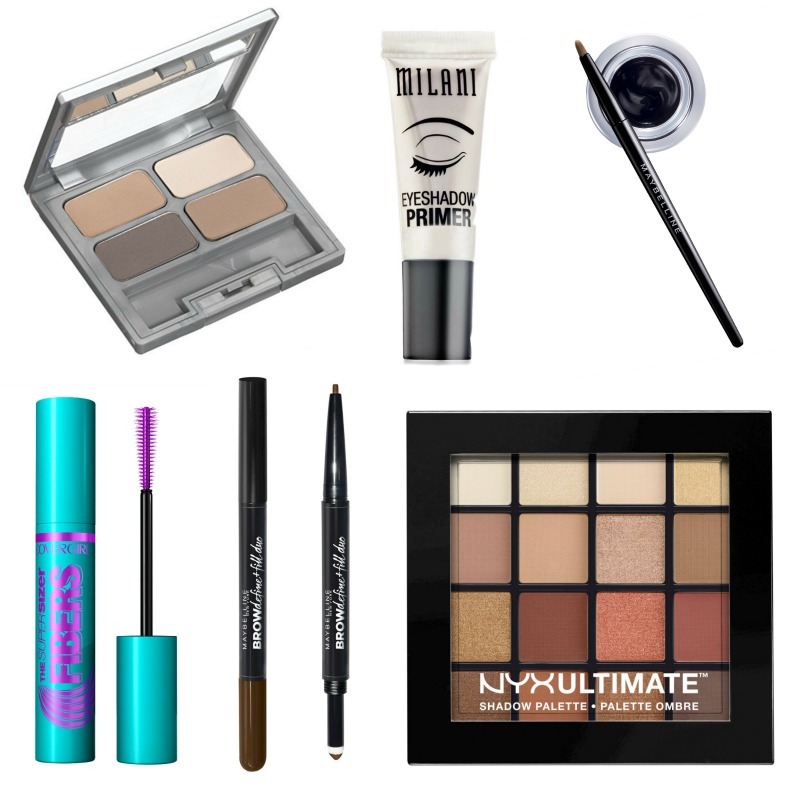 For this Ultimate Drugstore Makeup Kit, I selected what I believe to be the best of the best from each category. 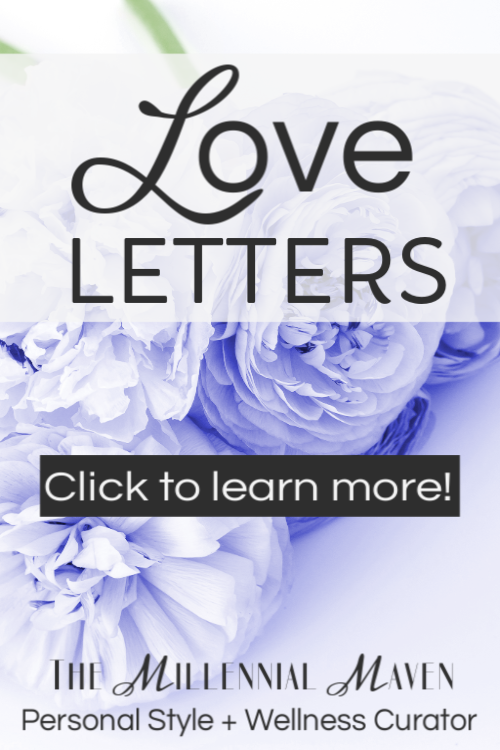 These are all products that I have personally tested, put through the ringer, and loved so much that I feel confident that you’ll love all of them as much as I do. 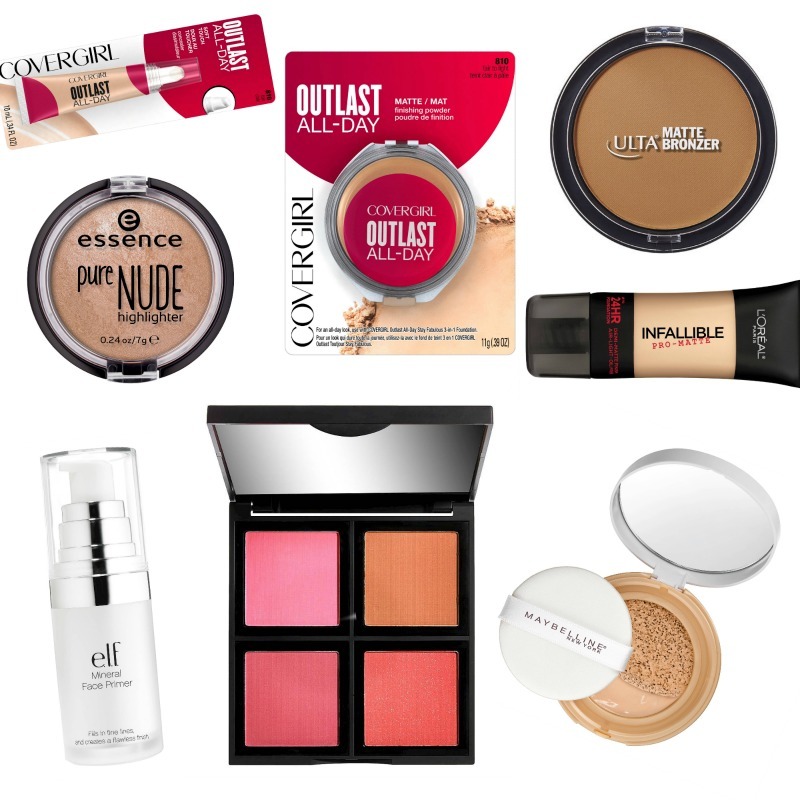 So if you need a cut-and-dry, no-questions-asked shopping list that’ll give you the best drugstore makeup face imaginable, then keep on reading! Eyeshadow primers can make or break an eyeshadow look. There aren’t too many choices for eyeshadow primers at the drugstore, and many of the options simply don’t work. Ahem, L’Oreal DeCrease, I’m looking at you. Thankfully, good options do exist, and this one from Milani is certainly one of them. The formula is smooth and easy to work with, and it provides a thin tint that help neutralize discoloration on your eyelids. Unlike eyeshadow primers, tons of different eyebrow pencils are popping up at the drugstore, but this one by Maybelline is by far my favorite. It comes in 4 shades, which isn’t a ton, but it beats the 3 currently offered by L’Oreal. The tip is slightly thicker than your average “micro pencil” such as the Anastasia Brow Wiz, but I still find it super easy to control and to get those precision lines you’re looking for. What I love about this one is that it comes with a bonus brow powder and sponge applicator built right into the pencil! I use it for setting the pencil for extra staying power, but you can also use it alone for a softer eyebrow look. If you’re only purchasing one product, it’s great to have options. Need more convincing? I have a full review on these eyebrow pencils on the blog! It’s right here >> Maybelline Brow Define + Fill Duo — Hot or Not? In my opinion, NYX makes the best eyeshadow palettes at the drugstore. They have the most different options, and the shades tend to be consistently good quality. Warm eyeshadows are super trendy right now, and this palette definitely fits the bill. But, there are also some more neutral browns you can also use if warm eyeshadow all day every day isn’t quite your thing. One thing I love about this palette is the selection of matte shades compared to the shimmers. Matte eyeshadows are so important when it comes to creating beautiful, complete looks, and so I appreciate NYX giving us everything we need all in one palette. Want to learn more about how to create awesome eyeshadow looks that “dupe” professional MUA skills at home? Right this way >> 10 Ways to Make Your Eyeshadow Skills Look Professional AF! This one is optional, but if you tend to be the easily bored type like me, then you’ll enjoy having the options! Physicians Formula doesn’t offer too many eyeshadows, but the ones that they do are amazing quality. The powders blend smoothly, they aren’t too dusty, and they offer just the right amount of pigment so they show up on the eyes but aren’t scary to work with. This little matte quad is perfection for creating cooler toned eye looks. Plus, the shades pair nicely with the lighter shimmers from the NYX palette to create some interesting and multi-dimensional looks. If you are only choosing one eyeliner for your kit, make it a black gel eyeliner! Gel eyeliners offer great versatility because they do everything that pencil and liquid liners can, plus more. They make perfect, opaque wings and upper lash line liner, but then can also be applied to your lower water line just like a pencil. For a smudgy look, simply apply a very small amount and blend with a clean brush. It’s that easy. If you expect extra length and volume from your mascara, then fiber mascaras are the way to go. They instantly add thickness to your lashes by introducing little particles that help build up the product on your lashes so that you get the most dramatic effect possible. This one by Covergirl is my ultimate favorite because it doesn’t flake off or smudge throughout the day. Also, the formula holds on to the fibers well so they don’t irritate my eyes. UPDATE: It has come to my attention that there is a new mascara in town courtesy of L’Oreal. It’s pink and beautiful, and called Voluminous Lash Paradise Mascara. I have yet to try this one, but I’ve heard some pretty ah-mazing reviews. Who knows, it just might dethrone my Covergirl. I’ll keep you posted. Honestly, regardless of what kind of skin issues you deal with, this miracle primer will help you. Seriously. Not to mention the price. You just can’t beat it. I’m giving two options for foundation because obviously, what works for one skin type will probably be a train wreck on another. We’re all different, ya know. For my oily skinned ladies, you need a good, strong mattifying foundation. This one by L’Oreal is bulletproof, yet surprisingly versatile. Apply it directly onto your faec and blend with a sponge for a flawlessly full coverage look. If you’re feeling a bit more au naturale, the formula sheers out beautifully with the addition of a small amount of moisturizer or illuminating primer. If you have dry skin, then you can take advantage of something I wish worked well for me. I recommend using the E.l.f. primer mentioned above to smooth out any dry patches, and then gently pat the foundation on with the included sponge applicator. There’s nothing better for dry skin! Yes, sometimes having a light coverage concealer around is nice. But for the most part, concealers are meant for one job- concealing. You’ll want something with awesome coverage that fights fading, creasing, dryness, and separation tooth and nail. Nobody was more surprised by the quality of this new Covergirl concealer than I was, because I’ve been a long-time critic of basically anything and everything from Covergirl. I just wasn’t a fan. Until now. Covergirl Outlast concealer provides amazing coverage for under eye darkness and blemishes and it stays in place all day without breaking down into a tragic crease-fest. If there is one product that is worth getting the very best, make it concealer. It can make or break your look. If you’ve got dry skin, then you can skip this one, but if you’re at all oily, then a good mattifying powder is a must in your drugstore makeup kit. Not many powders stand up to my level of oiliness, but this one does! Again, nobody is more surprised than I am! Dab (or in my case, pack) this powder onto your oiliest areas. For me, that’s my forehead and nose. Then, lightly dust the rest of your face. You’ll be set (literally) all day long. Nobody talks about this bronzer and I have no idea why. It’s one of my newest favorite drugstore face products. I always recommend purchasing a matte bronzer because it is just so much more versatile than a shimmery version. You can use it to bronze all over, or contour without looking too shiny. For a super streamlined makeup routine, apply some into the creases of your eyes for instant and easy definition. If you desire shimmer, feel free to add some using a highlighter. It’s that easy! When it comes to blushes, there is nothing more perfect for you drugstore makeup kit than one (or both!) of E.l.f.’s blush palettes. The price, pigmentation, versatility, and overall quality simply can’t be beat. For $6 you get four amazingly pigmented blushes. They prove so pigmented, in fact, that they make incredible eyeshadows should you want an Anastasia Modern Renaissance Palette inspired look without the Beverly Hills price tag. The palettes are super sturdy and perfect for travel. And here’s the best part- the individual pans pop out and are interchangeable amongst E.l.f.’s collection of face product palettes. That means you can buy them all (blush palettes, bronzer & contouring palettes, illuminating palettes,) and rearrange the shades to create several custom color collections! Highlighters are one of those products that are either really great or really terrible. For $4.49, Essence hit the nail on the head with this one. The powder is smooth and not chalky, and the formula gives your skin a beautiful glowing shimmer without being glittery. Perfect for everyday wear, so you don’t look like you’re trying too hard at the office, the gym, or anywhere where a full face of glam might stand out a little too much. Revlon recently came out with a new line of lip colors, and no surprise, they’re amazing. The skinny stick makes application a breeze, and the gel formula adds the perfect sheer tint of color to your lips. One swipe creates the perfect look for everyday wear. A few more swipes builds up the color for a colorful statement look. 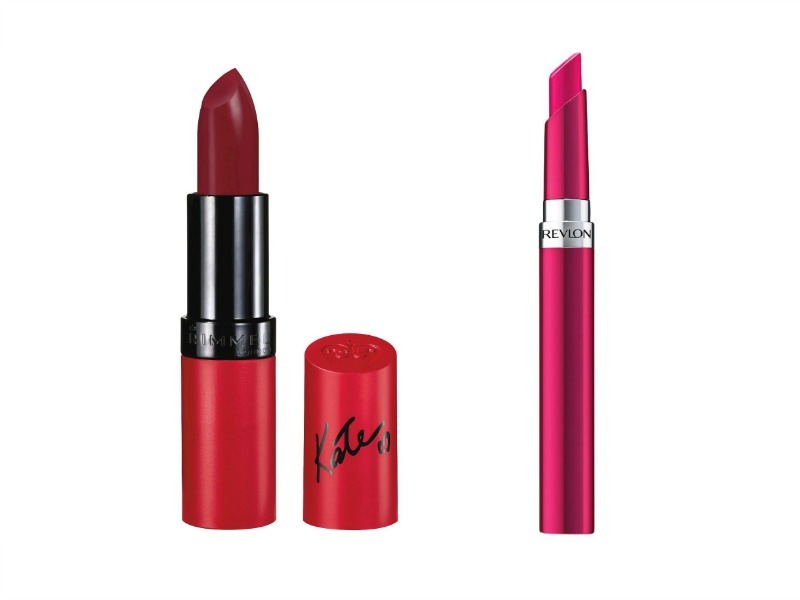 No drugstore makeup kit would be complete without a glamorous red lipstick. I love these two shades from Kate Moss’ collection with Rimmel because they are just SO pigmented. Seriously, they’re like pure pigment. The matte formula looks beautiful solo, but can also be dressed up with a sheer gloss, glitter, loose pigments, whatever you like!